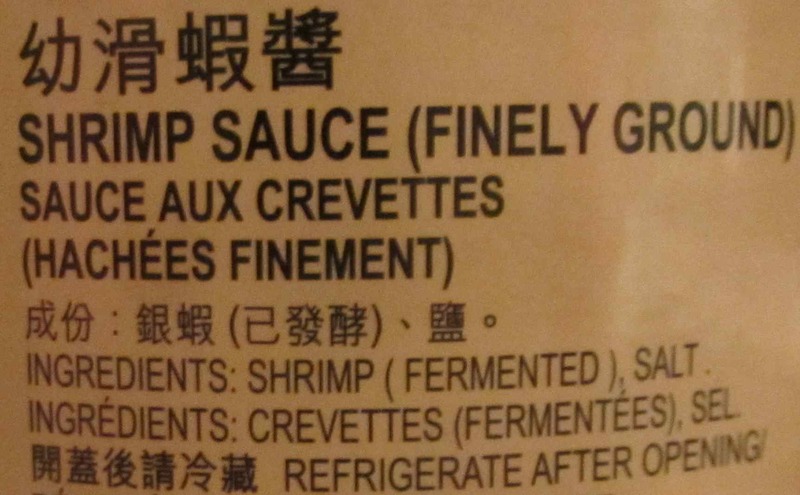 The ingredients list is fairly simple and straightforward and indicates that only shrimp and salt are used. The nature of the product is, however, a little more clearly indicated by the bracketed inclusion of the word ‘fermented’. As you can see, the paste is quite thick and has a rather muddy, purplish color, and I gather that the purple arises from a pigment in the eyes of the specific type of shrimp used. I should say here, however, that this particular jar was a bit more muted in hue than is normal and there were some salt crystals on the surface indicating some drying of the product. Normally, this might indicate some degeneration with a corresponding diminution in quality but, in fact, I found the aroma and taste to be somewhat improved. 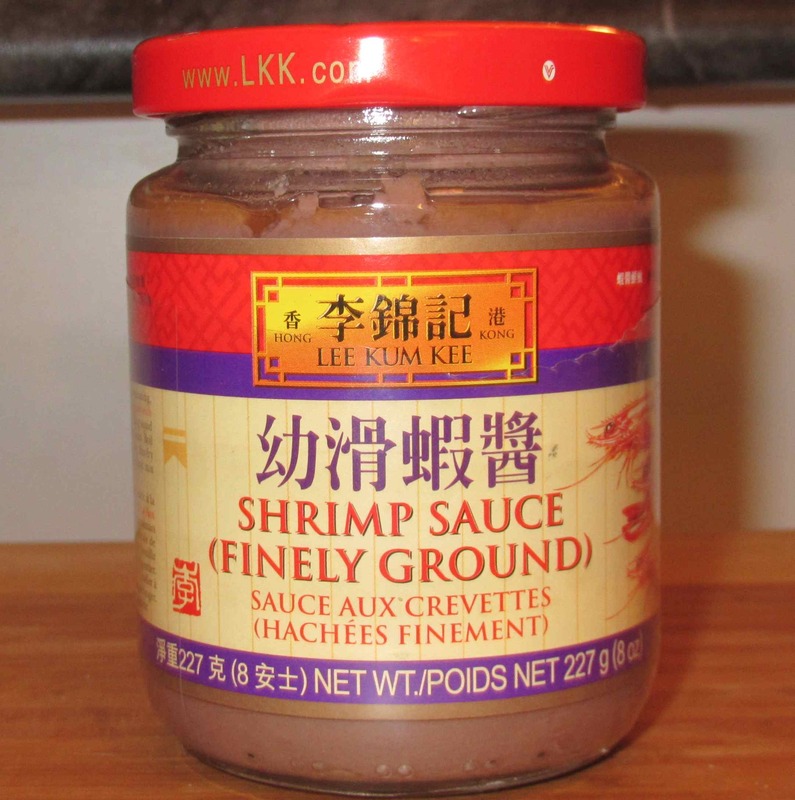 The aroma of Chinese shrimp pastes is not for the faint of heart in most cases. This brand in particular is particularly pungent and, beyond the rather faint hint of shrimp somewhere in the background the dominant component is something I can only describe as rather vomit-like. In this case though, the usual nauseating quality of the aroma was very much diminished and was not at all unpleasant (for me at least). I should hasten to add here, that the usual nasty aroma doesn’t translate into an unpleasant smell or taste once the paste is used in cooking. When added to a hot pan, there is a sudden, and very strong smell that isn’t appetizing but it actually disappears very quickly. Still, although Belecan (Terasi) does produce a very strong smell while cooking it doesn’t , I find, ever have the same nauseating nature and I much prefer it. The taste of the product right from the jar is, very thankfully, not the same as the aroma. It is, as one would expect, quite salty, but the shrimp taste, though pungently strong and obviously the result of some fermentation, is, for those who appreciate such things, very enjoyable. I don’t know if I can describe it any better than to say that it is like shrimp flavor on steroids. In cooking, the effect is rather like adding a tablespoon or two of anchovy paste to a tomato sauce in Italian cookery. It is ‘there’ in the final taste, in the sense that it adds a depth of favor, but, unless you use a lot, it just augments the other flavors without betraying the origin. You are brave! I adore shrimp paste, but I grew up with it so when I smell it being cooked on a hot wok, it stirs my appetite. I agree that it is an acquired taste though. Funnily enough, I have never cooked with it myself. I remember the smell of dried black mushrooms being rehydrated used to be revolting to me… now I love it! I think that used in small amounts (as these things usually are) the health impact is negligible. There is a Filipino shrimp paste (bagoong) that doesn’t look as muddy as the Chinese version, but maybe just as salty. Bagoong goes very well with a variety of Filipino dishes. 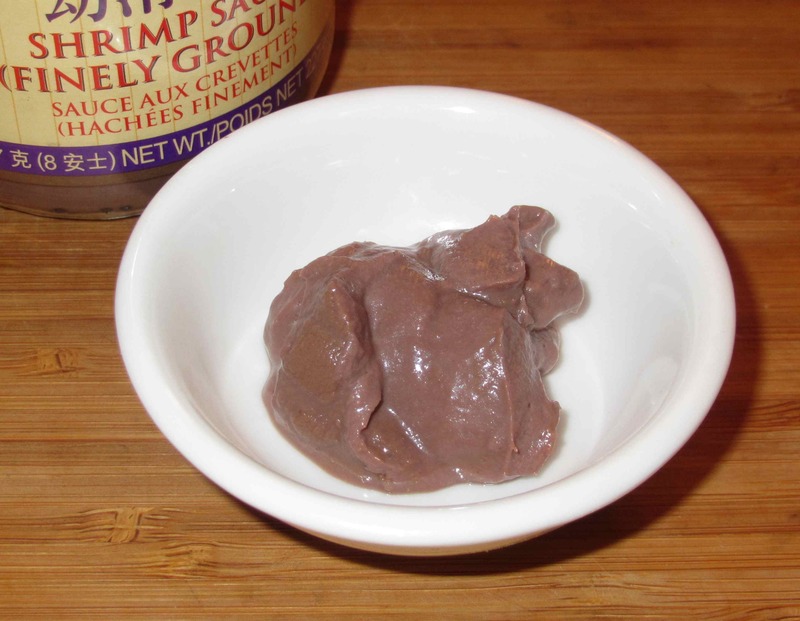 It can be added while cooking, but shrimp paste is commonly used as a dipping sauce. I love dunking my green mangoes in it. Saltiness and tartness–yum! I’ve heard of bagoong but not seen it anywhere. I’ll try shrimp paste as (or in) a dipping sauce. It sounds interesting with fruit. I’d never have thought of that. Love the stuff!! Can get it everywhere here. Or of course dried whole shrimps that one can make a paste out of! !